The 89th Academy Awards are on Sunday – this Sunday, February 26 – and if you haven't seen every Oscar-nominated film on the shortlist, don’t worry, you can catch up on many of the nominees from the comfort of your own home. Consider this article your official invite to a pre-Oscar binge party – one you can attend not in a $20,000 dress or tuxedo, but in your pajamas. OK, without any further delay, let’s see which of the Academy’s favorite films are streaming for your enjoyment. Hell or High Water was a diamond in the rough of a lackluster summer film season and more than earned its consideration for best picture. This refreshingly focused modern western tells the story of two brothers (Chris Pine and Ben Foster) who are pushed to their limits and must desperately turn to a life of bank robbing and crime. Jeff Bridges, who garners a nomination for his role, brilliantly portrays a gruff Texas Ranger who’s hot on the brothers’ trail. David Mackenzie’s Hell or High Water boasts a nominated screenplay by Taylor Sheridan, best known for his work on 2015’s Sicario, and is a beautifully told tale rife with moral ambiguity and perfect pacing. If you yearn for the days of more deliberate cinema, this somber western is definitely worth a stream this weekend. This moving drama is undoubtedly Oscar-bait, and that’s not a bad thing. Manchester by the Sea is a subtle and quiet film that works and tugs on your heartstrings for over two hours, but doesn’t feel manipulative in its execution. Instead, writer and director Kenneth Lonergan delivers a compelling story that earns its emotional crescendos. The film centers on a janitor named Lee Chandler (Casey Affleck) who tragically lost his wife and children. When his brother passes away, Chandler becomes the guardian to his 16-year old nephew and must finally face his shadowed past. Manchester by the Sea not only garnered an impressive six Academy Award nominations, it also became the first film from a streaming studio (Amazon) to receive the best picture nod. If you’re into well-written family dramas, be sure to catch Manchester by the Sea on one of these streaming services this weekend. Arrival arguably made the biggest pop-culture splash of the best picture nominations. More importantly, it’s a brilliant piece of cinema through and through. Film buffs are well aware that director Denis Villeneuve has been quietly establishing himself as one of the best filmmakers working today, boasting films like Enemy, Prisoners, and Sicario on his resume. Thanks to Arrival, he’s on everyone’s radar now. Arrival tells the story of a linguist played by Amy Adams (one of the most egregious snubs of these Academy Awards) who is working to communicate with an alien race that has descended on Earth for some unknown reason. Unlike many modern alien invasion flicks, Arrival doesn’t rely on explosions and millions of dollars in special effects (we’re looking at you, Independance Day: Resurgence.) Instead, Arrival is well paced and thoughtful; the type of movie that leaves you silent on the drive home from the cinema. This film certainly earned its eight Academy Award nominations and will likely stand as milestone in sci-fi culture. If you somehow haven’t seen this film by now, be sure to catch it on one of the streaming services. This film a small, independent production that was shot on a cheap budget in just 25 days. It also happens to be one of the best movies of the year. Moonlight was written and directed by up-and-coming filmmaker Barry Jenkins, and is a brilliant piece of focused cinema. The story follows a shy child named Chiron who grows into his adulthood in one of the roughest spots in Miami. The film is divided into three time periods in Chiron’s life: young adolescence, mid-teen, and young adulthood, covering the trials and tribulations of his young life. This film is a refreshingly well-thought commentary on race, young life, and self-discovery. 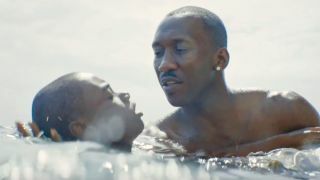 Like the other nominees on our list, Moonlight deserved its load of nominations is definitely worth a stream this weekend. He’s back! Mel Gibson, that is. With all of the controversial statements that Mel Gibson has made in the past, it’s easy to forget that he’s one of the most captivating directors in the modern age. Films like Braveheart, The Passion of the Christ, and Apocalypto are each firmly embedded in the cultural zeitgeist. Of course, they’re also brilliantly directed. Now, we have Hacksaw Ridge, the amazing true story of Desmond T. Doss (Andrew Garfield) who saved 75 men in Okinawa without firing a single shot. Gibson does what all great war directors do -- captures the heroic human spirit while not shying away from the horrors of warfare. Yes, this film also features some of the most shocking and terrifying war scenes put to film since Steven Spielberg’s Saving Private Ryan. Hacksaw Ridge represents a cinematic experience that’s almost lost; the heroic tales of an ordinary person in war. Whether or not this wins any of the golden statues come Sunday, it’s great to see Gibson back in the saddle again. One of the biggest and most pleasant surprises in the nominee field was Viggo Mortensen for Captain Fantastic. No, he’s not Aragorn from Middle-Earth anymore; he’s Ben Cash, a hardened survivalist who lives in the wild with his wife and six children. After tragedy strikes, Ben must return to the real world and take his kids with him. His eccentric children are faced with the realization that perhaps being totally disconnected from society isn’t all it’s cracked up to be. This Matt Ross directed cult-classic in the making didn’t get much attention outside of the best actor category, but it’s a well-crafted, quirky look at a unique character and his family. If you haven’t caught Captain Fantastic yet, it’s worth the two hour investment. For those who love animation done right, Laika studios is the holy grail. The stop-motion studio famous for Coraline and The Box Trolls raised its own bar with the exciting, yet poignant adventure film, Kubo and the Two Strings. Kubo and the Two Strings follows the title character (portrayed by Game of Thrones’ Art Parkinson) on a life or death quest to find a magical suit of armor that belonged to his fallen Samurai father. Along the way, Kubo receives guidance from Monkey (Charlize Theron) and Beetle (Matthew McConaughey) as the trio works to avoid evil witches in the night. It’s been accurately called the Legend of Zelda film we’ll (sadly) probably never get and is a thrilling adventure from start to finish. There’s enough gags for the kids and enough serious themes for the adults to keep the entire family entertained for the night. Kubo is arguably the most original film the best animation category this year and should definitely be on your must-watch list. Zootopia is one of Disney’s two nominations in the animated feature film category this year and it’s effortlessly easy to stream. This film tells the story of Judy Hopps (Ginnifer Goodwin), the first rabbit to join the Zootopia police force. Partnered with cool fox Nick Wilde (Jason Bateman), officer Hopps quickly learns that enforcing the law is no small task. This hilarious and beautifully animated film also subtly manages to sneak in ever-so-important themes regarding the harmful effects of prejudice on a society and the role police should play without ever feeling preachy. Zootopia is the only film on this list that’s streaming on Netflix, meaning you have no excuses to miss this one. And, even if you don’t have Netflix, there are plenty of other ways to catch this entertaining and thought-provoking nominee this weekend.